Does the Inside Back Cover of your book contain a hologram as pictured? If so, click here. If not, please continue leaving a review. By leaving this review and accepting this free offer you are also accepting to receive occasional email communication from us regarding new product releases, product updates and discount offers. We do not share your information with anyone. Lite å smidig, tåligt papper som tåls att bläddra i. Fördel mot Google då man hittar även sånt man inte letar efter. I use almost everything in this book daily. It is a good supplement to Machinery's Handbook. Easy to read and find most things. I'd like to see some references for thread milling. Excellent reference material, especially the carbide and toolholder information. Small concise reference book, replaces many other reference manuals. I would like to see basic G and M codes i.e. G54, G17, M19 as someone who hasn't done ISO programming for a long time. Also as newbie to CNC turning with a 'Y' axis maybe a graphical representation of the axis, i.e ZC showing edge, ZY showing a pocket in the orientation it would be machined on a billet. Nice improvement over the smaller version. I’d prefer even LARGER version, A4 or 8-1/2” x 11” format. I found putting the tabs on by myself was a pain but after I finished I realized I should have only put the tabs on those sections I most frequently use… so in reality letting the reader place their own tabs is a good thing. The book has an excellent table of contents as well as an excellent index so finding information has never been a problem for me. Thanks, nice book. George, Thank you for your review. We just released a new larger 10 inch high edition. Yes, the Index tabs were intentionally included separately so the user could place them where they wish. I wish the drill sharpening gauge came with all the versions of the book. Also it would be good to have a small print or marking to place the adhesive tabs. This is the best reference book i have ever came across. Lay flat binding, coated pages. Great book for the apprentice, too. It is a well structured book. The visual disposition of the concepts allows a better understanding of the different nomenclatures for bolts, nuts, mills, bits, taps, dies, inserts, toolholders, etc. The information is accessed more quickly and is easier to understand than in other reference books. Some pages (3 or 4) with some defect (slight blur of the print), but that does not make reading too difficult. easy to reference, great paper and binding, included stick on tabs are a bonus, good size, easy to read (check back in 20 years though, my story might change), honestly just well put together. Ordering of topics may be better suited organized a different way. Well organised and extremely useful content. Love it. Very well thought out and durable, high quality publication. It's a great desk reference. Wish it had more material information like strength of materials etc. I should have purchased years ago. Great book with excellent information. Easy to find information, at times it beats googling and sorting through riff-riff . Small book, large quantities of information. Easy to find what you need when you need it. Really handy book to have in the toolbox for reference. Has everything you would most likley need to know in such a compact size. Great Book! So much better than the MH! Its far more user friendly and more durable in the shop than other comparable books. easy to find what you're looking for with the great format and tabs. Durability is excellent. this book is a pocket personal assistant! summarized materials makes the work more efficient! Absolutely love the book but there is no mention in the workshop metals section of 5083 Aluminium. It is the most widely used aluminium here in WA, mostly in the marine industry. I love everything about this book, it has all the important day to day information I could ever want (and some) for the home workshop and at work. Great compilation of charts and info. I am a hobby machinist and this is a great reference book for my home shop. Love the size of the book, but also makes the text small. Not really a con, just the way it is. I always use my safety reader glasses in the shop anyway, so not a big deal. I have it on my desk at work, it is a great resource to find data and information, great book. Compact size, lay flat design beats the pants off other reference books. Packed full of useful and to the point information. Book is also very well constructed. Lays flat on the bench. Hi George, thank you for leaving a review. A larger print copy - 10 inches high will be available for sale in two weeks time. This is a great resource to have as it's much smaller than the Machinery Handbook but has a ton of good information. Love the coolant proof pages. A bit more information on turning speeds and feeds. Good size, does not feal like it will fall apart soon, all the info I was hoping for and more. Hi Fredrik, The pages are tear proof so don't expect them to tear off the spine anytime soon! Thank you for your review. Tough pages, really like the anti-glare coating, more information than I expected. Would like to see cutting speed chart, based on material, type cutter for turning, milling and reaming, for carbide and HSS. The metal binder, took mine to the office supply store and had the binder replaced for spiral binding. I usel hate bocks bug i love this on. This book has very interesting information and data that I wasn’t aware of. Lacking cuting speeds for hss in different materials, a sektion about welding and soldering. Best book ever! This is the second edition I use. Easy to read. All the basic info you need! Amazing detail. Simple. Great quality. This book is a great help in the shop and the size makes it easy to have on youre person at all times. It saves you a lot off time serching for the right information. Love it!! Easy to read and small in size. All the basic info you need. Would be great with a thicker lamination of the pages so its more ridged. The binder punching caused many pages to be almost glued together so took ages to separate them without tearing. Would like to see a little more info on heat treating: specific temperatures and covering other metals. Great and very practical book. Well organized. Tables have contrasted colors and are easilly viewed in different light environements. Laminated pages are strong enough to be durable and light enough to be practical to use. I like especially the summaries on the screws, threads, tapers, and the conversion tables which are rapid to find. Clear. Information is well to the point and concise. Great book.. can't wait to see it evolve.. Very handy book lots of information. More durable than the machinery hand book. I was hoping there would be a v-belt pulley dimensions guide. I see the general info but nothing about the dimensions needed for various pulley geometries. Perhaps not something needed on a daily basis and therefore omitted. Excellent quality, have it by my side most of the time. everything I ever needed . Also: free poster. Lots of valuable information . Page material is perfect . Well thought out and assembled. Print is too small in some parts. Excellent book, definitely won’t leave my side. Well presented, concise, and packed with information. This is an awesome little reference book. This book contains just about everything I can think I would need when working on various machining jobs. I would like to see information about bearings in a future version. The black book is such a useful and handy technical reference, I would be lost without out! Super cool to have this book in swedish. Nice size and I love the spiral. The non-stick pages are great! Should have a nicely rounded cut out index for fast acces to the different sections. The Black Book has answered many queries I've had around drills, drill sizes, taps and tapping. The section on steel hardening and tempering has helped a lot on my knife making. Ive also enjoyed the ready reference to common Trigonometry formulae, many of which Ive forgotten. Overall it has a wealth of information for any aspiring or practicing Ingeniator! sits flat on the bench, durable finish on the pages, well referenced and comprehensive. small size means writing is small and I need good light for these 60 yr old eyes to see well. A5 size would still work well and allow for larger font size. Either that or stronger glasses!! Lots of useful info, I use this book almost daily. Excellent quick reference. I really appreciate the dirt proof paper. Very handy to have on you at all times in the workshop. Tons of data in a small convenient package. Really like the included inch/metric socket equivalencies chart. Just the right size for a paper-based reference. Spiral back a bit grabby against paper towards front and back of book. After using my supervisor’s 1st edition for a couple years, I finally bought my own. Now on it’s 3rd edition, I can’t say enough about it. Very handy for a quick reference on tables, formulas, and info you don’t use everyday. I’d recommend one. Nice small size. Spiral bound so it lays flat. Lined pages so grease won’t soak through. Wish it still came with mini drill reference plate. The crisp print of the diagrams and easy to read table formatting has drawn me toward picking this up first - before going to the other reference books / materials I have collected ( and I do have many). Very useful and handy , because of its size ! Bolts chart , page ( 92) . Thanks for a great Book ! VERY USEFUL TOOL. TEST ENGINEER. VERY MODERN STYLE, CLEAR AND CONCISE. GREAT USE OF SIMPLE DIAGRAMS AND COLOURS MAKING USING THE BOOK EASY TO NAVIGATE. NO NEED TO READ THROUGH BLACK AND WHITE TABLES AS PREVIOUSLY DONE. A phenomanol amount of information in such a small book. Covers just about everything I'd need to know. Wish I'd had this in my 40 yrs in marine engineering . Very useful and pocket sized to boot. Very pleased with the book. Loads of useful information at an affordable price. Every page laminated, glare free, & washable. Wish the spiral bound back was a little larger. Unable to fold book around completely. It is absolutely incredible the sheer scale of detail crammed into one small Black Book, I couldn’t recommend it anymore. If you have anything to do with engineering or manufacturing it is an absolute necessity. The information provided is absolutely extraordinary and the laminated pages means it can survive in a workshop environment. A GREAT quick easy to use reference. Thanks for the invaluable tool. Quality, ease of use,paper coatings. Clear and concise with everything most machinists will ever need. Compact pocket book easy to use. Small if you have poor eyesight even though the text is very clearly printed. Kalaskompis i fickan alltid till hands. Very concise and easy to find information, faster than paging through the Machinist's handbook for quick reference. The 3rd edition has some nice new information, such as the heat treating metals section. Convenient size, cleans up great, long lasting, easy to find information. Wish I had it sooner. Best little handbook of information I've ever had. I'm new to machining and am finding it very helpful. I really enjoy having this information for quick references for different materials tomath formulas. It’s also a great reference for threading and other dimensions. Vbts and gearing too. Some of the pages were bound upside down in my copy. METRIC AND IMPERIAL, GREAT TOOL. Very well thought out collection of information, diagrams, formulas and tables. I would highly recommend this little book to anyone that needs a quick reference in the shop. Easy clean pages! And the included page tabs are a nice touch. Awesome little book. It’s a must have. If you do any kind of metalwork or fabrication you need this book. Overall happy with this book. Don't enter the shop without it! Very handy and useful reference book. I wouldn't enter the shop without it. Loaded with useful information. Saves lots of time looking up values online. Best book for machinist! Very usefull information for everyone. Every machinist should have his own Black Book. The durability of the pages is great. Clearly printed, well laid out and very easy to read. None other than the rear cover not closing properly. The metal spline is in the way. Seems to be well thought out. Needs sticky tab for "INDEX". The back cover is on the wrong side of the metal spline causing it to not close properly. I realize its purpose is to be a pocket companion but I wish it had even more info in it or if it was broken up into multiple volumes. Machinist info metal info ect. Great info provided in a easy to use format. A must have for any machinist. Wow tons of info !!!!!!! Nice clear and concise for a beginner. A little book with a lot of handy information. Every engineer should have one! Clear and easy to read layout. Superb amount of useful data. Pages can be wiped clean in a workshop enviroment. Not much at all. Maybe would benefit from colour coded sections or page edges? Very handy pocket sized book, full of information. Great reference tool for any technical field! Well organized, comprehensive versatile tool - I'm excited to finally have a pocket reference this wide-ranging, especially the practical conversions and easy to read tables, charts and graphs. Contents are logically organized, graphics are easy to read and understand, conversions are aimed for practical application. I wish the index tabs were already attached, took me quite a while to do myself, and I still didn't get them straight. Just the essential info, easily navigated. Perfect size for both the workshop and field use. Very durable. Everyone should own one. Fairly comprehensive and easy to use. Provides the relevant, to the point information in a clear and concise way. Been going to get a copy of this for while and now I wished I'd brought it sooner. As others have said, a bigger version would be nice ( A5 or even A4) for the aging customer! For a quick reference guide it is what one would differently want to have in his/hers collection. Book is well informed and displayed out nicely. Understand that this book is made to fit in your pocket. It would be nice if a large print book was also made. All the main go-to information in a clear and well presented format. Could benefit from cuttaways for easy page turning like some other volumes. Nice and concise with every bit of information you could ever need. Best all round engineering book out there. Best engineering book by far has lots of useful information on anything you will come in contact in a work shop, easy to read and understand. Pages become easily dirty could laminate them ? Great source for commonly used information normally found in the Machinery Handbook. Wish I'd discovered this book years ago. It's great to have on hand, and a great refresher for a lapsed mechanical engineer like myself. Pages are a little hard to turn. Bigger spiral binding would help there. An option to buy a version with bigger print would be great too. Very handy reference book for mechanical trades. Absolutely amazing so handy to have, has the information you need right in the palms of your hand. Wish they made a complete book with all the other black books combined. The content of this reference manual and the quality of the printing is astounding. Great for looking up small details that sometimes slip the mind. Well-organized and easy to read text and graphics. Nice little drill point gage included! I once tried to look up screw thread engagement rules of thumb, and didn't find it. That's OK, in order to keep the book short (and lightweight), attention must be focused on the more general content. No biggie!! Use it all the time. Great tome of information always keep it close at hand! The best black book a man could ever have. Size is perfect for pockets, plastic coating is great to keep it clean. I can't think of anything that could make it better unless you could make one bigger in size si the print is bigger and you could put a hole in it to chain to your work area so no one could steal it. Excellent, much more accessible Machinery Handbook. East to use in the workshop or out and about. Great book with a ton of useful information. I wish they would add an additional couple pages to add nominal dimensions of weld and seamless steel pipes. As of now, it goes up to only 6", and I usually deal with piping larger than that. Another thing is my book came with a misprint and had to place essentially a sticker on top of the mistake. Although that may be a more picky comment, at least they sent me the sticker to fix the problem, so that's a pro. Great book overall! Clear to read and locate info. I cant fault this handbook! Its a must have! Have yet to meet a situation where this book didn't have the reference I needed. Small enough to fit in pocket pocket or bag, and easy to find whatever reference I'm looking for. The ring binding that holds the pages is just small enough to let the page edges catch and flip over on it when flipping through, so they get a little damaged after some use. The oil resistant paper is very tough, doesn't look dog eared even after 4 years. None that i've come across! Great reference book. Just started my apprenticeship and this was one of the first books i wanted to get! Very helpful in updating the last 60 years since being trained. Since my training in Australia they have changed to metric and it is helpful to have a reference with both. I wish I'd got one years ago! so easy to use, easy to understand. Looking forward to this being my toolbox goto! A combined edition with imperial and metric would be very nice! This is hands down the best reference book ever created. It has everything you need from "the handbook" with out all the things you don't. I have had a black book for probably 6 or more years. I always recommend it to new guys. Tough, easy to clean pages, everything a machinist needs in his toolbox. I cannot buy a digital copy yet. I want a searchable PDF and/or a phone app. Lots of images and info that you need right at your fingers. The mahinist handbook i purchased has sat mostly unopened as me being a hobbiest there is an almost daunting ammount of info for a simple conversion/formula/etc. I know that its no replacement for the bible but I am extremely happy I purchased it and plan to use it right away! Tons of well laid out information, durability and quality. Does not come with the included drill gauge like ive seen, not a deal breaker but was expecting it. Great little book full of really useful information and the newer version being spiral bound is a great improvement. Loads of essential information in a small size and easy to keep clean with the coating on the pages. A really useful addition to my refernce documents and its pocket size makes it very handy for workshop use. Engineers Black Book 2nd edition. Contains virtually all information, data a machinist would encounter. Pocket size, very handy to have. Contains interesting information--some of it would be hard to find elsewhere. A Reference Book You Can Actually Use Everyday ! Just received my new book. Looks like it has all the info I’ll be needing in this handy reference. Haven’t had a chance to assess. Given to me as a student and used in many different applications. A great size with packed information. Handy reference for commonly used tables and figures. Very handy reference. I keep it on my desk and use it almost daily. Small, concise and to the point. A must have reference for any engineer. I use it every day! High quality moisture resistant pages. Handy size. Lots of info that you sometimes don't realize you'll need, until you do. Some of the information could be better organized. Not much this book doesn’t have to help you in an Engineering workshop, very pleased with it. Pocket size & tough non grease pages. This is an essential tool in my workshop. You do not know how much you need this until you get one. I keep this in my shop apron pocket and utilize it constantly. Sure, you can find this info online, but for me, this book is far more convenient when I have oily/nasty fingers that I don't want to get on my phone to look something up. Honestly, none that I can immediately think of. Excellent reference to have around the shop. It's clear the authors have thought about what's needed from a pocket reference book and aim for just the right combination of theory, charts and practical tips. The book is made out of very nice material also. I'm not afraid to leave this on the workbench. Some of the information could be better organized. Basic math and geometry/trig pops up all over the book. It could use sections with clear separations - machining, drafting, materials and so on. The section on adhesives could use info on breaking and removing. Maybe add a section on common solvents? Gear and bearing pulling and removing is a fairly common task that's sometimes daunting for a novice. Maybe a subject worth adding? There's some theory on surface finishes but not much on how to achieve them. Some basic info on what feeds and speeds to use might be useful. Personally I think the section on G-codes and numerical control could be removed. It feels to brief for a useful reference and the exact codes are largely dependent on the machine/controller anyway. Like the Engineers Black Book which I've had for a few years and has absolutely everything in it, this is the same for fasteners and has made a wealth of knowledge easily available. Absolutely everything I could ever need to know in an easy to access format which will last a lifetime. This is an amazing cheat sheet book. It condenses a lot of the books I have at my desk into 1 helpful location. Drill point sharpening gage included! All the info on drill point geometry and purposes comes in real handy when working with operators who don't understand the differences. Brushes up on most things you use daily in your average machine shop. I have yet to find something I dislike with this book. I am blessed with the Swedish edition and still cant understand how I survived until today without it? A true gift from the gods! A very handy little book with great up to date info for more than I need. Been wanting one of these for ages, finally managed to get one! Every 'machinist' should have one in their toolbox!!!!! Everything is there, it's easy to read and find the information I need. The 'treated' pages are great, in case of dirty hands. It's a very valuable addition to my workshop. The information on 'Coolant and Lubricants for various metals is an amazing aid, whenever I need it. Can't come up with anything negative. Easy to find data, information beyond basics and all in a portable package that can sit in the top of my work toolchest for ease of access. convenient, concise, this book is a lifesaver. That I waited so long to acquire one. This little book is never far from me, fits in my shop apron pocket. Very useful and informative. I am new to running lathes and mills so I have much to learn. I truly appreciate the layout of the book and the index. "Handy" does not do the book justice, for me it is essential. Answers to questions I did not know to ask. Very logically constructed and assembled. Drill point sharpening gauge very useful as well as the handy pocket in the book (I can find it). Size is just for keeping close. What a great product, love the grease proof pages as my workshop manuals have all got oily pages. Love the drill guide so handy. Pages are protected from the dirty shop environment, and tear proof. All information is accurate, and quicker than going for the “big book”. I wish this was available in an App! A little small and the spring binding could be a bit larger in diameter, would make it easy to lay flat to read with out holding the last several pages down. I waited way to long to buy this book. It really is a must have for any mancave. Has so much information in such a small size. It would be very beneficial to add a section on Cogg Gears and drives calculations. Has everything I need in one spot. Great for basic stuff like conversions and basic geometry that I can't remember from high school. Also learned quite a bit about carbide insert nomenclature. A lot of useful information in a tough, small package. Could use color coded page edges for easy locating of contents. I do not believe that there is anything in the book that I don't have access to elsewhere. This is, however, the first synopsis that I have come upon which appears to contain all of the reference data that I am likely to need without noise or omission. Small, portable, complete, easy to access and it is resistant to oil stains. I only wish that I had found this small book many years ago. I’m learning to use a small lathe and a small milling machine. I have been viewing YouTube to learn and everyone I see has or uses the Black Book. I now own one and wow its full of great information. All the math is put in easy to understand format. There are lots and lots of very useful charts and cross reference material. I have to remember to take my glasses, but that,s reslly a con against my eye sight. Ever since I've purchased this book Ive never not taken it to work, as a sheety it helps me tons with formulas and things you naturally forget over time! Brilliant little book very handy, everyone should have one. Very helpful for checking lots of data. The paper it is printed on is heavy duty and grease resistant! Very easy to read and find the info I need quickly. Made of good materials. Easy to clean. This book is simple and straight forward. Gives you the information you need and is super easy to find! Great quality pages, straight forward, and so much information! Great book. Have it close by all the time. Material of the book feel like quality. I am mostly a self taught machinist. The black book has a wealth of explanations and easy to understand information. I am not sure how I got along without it. A great addition for somebody living on the wrong side of the pond using tools and sources from the States like Tubalcain and Tom Lipton on YouTube. You see that a man from practice created a well thought reference. Especially the metric/imperial comparisons or the international metal standards charts are fantastic. It is so good you should not leave it unattended or somebody will take it. Print quite small for the aging eyes. Really like the book, bought it especially for the description of carbide inserts and specific tool holders. Also like the bolt circles/areas/etc for milling and turning operations. Great machinist reference book. Lots of good information. Book will be used often for layouts, feeds and speeds, and carbide tool selection. Also, a very nice drill gage. Print is really small! Also, since the main reason I bought the book was so that I could better understand carbide insert/tooling nomenclature, I’m very disappointed that all the threading inserts are only specified in metric. I thought I was getting the “imperial “ version of your book. Also, I couldn’t find specifications for carbide parting tool holders and parting specific inserts. Please include Hydraulic symbols, formulas and examples and some general examples of Engineering formulas such as Euler, Johnson and rotational inertia, out of balance and Centroid of inertia on beams etc. Good amount of info, nice size for easy storage in work truck/ tool box for site visits. Free drill gauge also handy. Size of print getting difficult to read, eyes not as good as when younger without glasses. Absolutely love it. I wish I found this gem years ago!!! Incredible amount of essential information for my hobby machine shop packed into this little book! This book is a good all around basic reference book. It has a lot of great and valuable as well as very useful trig and geometry formulas to get you through to tough measurements. I think it too basic for any one who is either learning the information or in my case having difficulty remembering what was up there for 40 yrs. And the old hard drive is needing more memory. Excellent. The more I read in it, the more I find this book indispensable. Book should be bigger. The print is sometimes difficult to read. Excellent resource for a tradesman wanting to brush up or a apprentice wanting to leave new information. Excellent dirt-proof pages and easy portable size for the amount of information. Paper it is printed on. Lots of information. Pages are wrinkled not sure why, it is brand new. Seems to have all the right info right on your finger tips! Lays flat and easy to read/use. Great information. Nice format. Made of good material. This book is a super handy reference. Machinery's Handbook goes into far deeper detail, but the Black Book is meant to be a quick reference guide and it does that well. It is a very user friendly and makes a useful day to day bench top reference guide. Tons of information in an easily found format. It has sturdy pages which should hold up well in a shop environment if not abused. The print is on the small size, which necessary to fit all the info into a 4x6" notebook sized guide. If a 6x9" version with larger print were available, I would buy it. The best engineers pocket book available l have found. Very thorough, comprehensive collection of information readily available to any engineer and or hobbyist. Easy to read, Concise bible of information. Fantastic book has great content, I wished I'd got one sooner. Plenty to read and more. I've never understood the numbers on carbide inserts but with the "engineers black book" it's all crystal clear. Good illustrations, easy to follow tables and charts. Bright colors used are ideal for use in low-lit areas. I'm not sure how long the binder will last in a workshop environment, it's pretty thin and flimsy now from New. 100% worth just for the carbide insert and holders charts. Engineers Black Book - Extremely helpful. Awesome little books full of extreamly useful data. The section on carbide inserts is very comprehensive. High quality diagrams, good layout. Easy to read. Covers massive variety of information, it's durable and easy to understand. A compact and concise layout of useful information relating to metal fabrication. Generally contains an effective balance of diagrams, tables and text throughout the book. Good for a quick comparison of tools/methods/materials/treatments. Nice overview of drawing abbreviations and symbols (although no references for welding). Some odd imperial units sneak through into the metric edition without having a metric equivalent. For example, common metal tensile strength is given in tons/in^2 only, not MPa. Some approx. yield strength, fatigue strength or elastic modulus would have been nice, and perhaps could have replaced some of the columns of imperial conversions. No section on welding? No section on bearings? Contains all the useful information that's had to find online, the guides are very informational and the gauge is extremely helpful. Awesome little books full of extreamly useful data. Love it!!!! Just what I needed, use it every day! Tons if info, heavy soil resistant pages. Great book. Comes in handy. A must read for all engineers. Very detailed book. Help me alot when apprentice. Easy to read unlike some other books wìth smaller print. Fabulous reference book! I bought several for my team. The quality and size are perfect for our applications. Pocket size, protective coating, spiral binding - lay flat. This book is real handy at times especially when one finds oneself with brain lock. Good for refreshing the memory or needing to quickly find a few specifications. A little short on metal identifications such a en30b steel and 1018 DOM but space is limited with this book. Handy sized book. Pages have a plastic coating so should hold up well. My book was badly made. The holes were not punch clean, about half the pages were stuck together. Took me a long time to separate without tearing the pages. This will help with most of the information I was looking up before, such as thread major/minor diameters. The section on common metals misses some of the most common alloys, such as 6061 aluminium and 1018 steel. In the US 6061 is by far the most common aluminium alloy. As an apprentice fitter and turner Engineers Black Book is a must have. Lacking explanation for which carbide tip to use for particular applications. I could not make it through the day, without this book. This book is amazingly useful. Now everything is lot easier for me now. Quick and easy to use. Pages have a coating to protect them. Formulas need to be explained a little bit better. My most used data is close at hand! My copy of Machinerys Handbook is now located in my library. Seldom need it for data. Most of the shop info I require is right there on my workbench. Way to cool. Great tool, no workshop should be without one! So much usable info. Will be using this a lot in the future. Easy to understand. A lot of info on things you did not think you needed to know. That my brain can't take it all in at once. I'm just starting out in metal fabrication as a hobby. This book will help shorten my learning curve. Will be looking at your other products. This an excellent resource for anyone working with tools, metals, mills, lathes or welders. This book is absolutely fantastic with every bit of information you’ll need. I’ve been using this throughout my apprenticeship in tool engineering and it has helped me in many various scenarios. Very Thorough. Sometimes mind numbingly so for the casual DIYer. Been using this book since I started my apprenticeship. Handy and always has the right information I need. I have been in engineering for over 54 years and I have never seen such a helpful and concise book. Whoever designed this book, wwell done you. Spiral book spine allows the required information to be always on top and easily available. Great selection of useful information in a small, practical format. I would prefer a book just a little larger. Welding isn't the easiest on the eyes and some of the charts are a little small. Excellent useful hand book perfect size. One important thing is missing basic welding data:classification of welding consumables,and base metals:carbon steels,alloy steels,aluminum,and more.the selection of the right consumable for a given material. Great and Handy book for any Engineer! All the advice is very helpful in my work. Love it! This book is worth any penny paid. It helps a lot with production. Thank you for the great book!! Generally I would say it is a valuable a good buy. Vast amount of reference material, well laid out. The pages stick to together a little and the print is very small. I use p 43 for drill cutting speeds in different materials. Would like to see an extensive chart for cutting speeds in different materials for both HSS and carbide. Hi Jason, please take a closer look, the pages are laminated. You can test them by placing some oil on a page to test. Thank you for leaving a review. As an amatuer I am always needing to look up information. This little book has any info I have needed so far. I have just received the book and have already found many chapters that will help with every day questions. Great tool to have at your fingertips. Great book, have used some sections extensively during my MSc thesis (Molecular Life Sciences student) where I worked on developing parts for a microscope setup. Only regret not getting the Fastener Black Book, as the info on fasteners is somewhat limited. Nice book, easy to find in tool box or site bag. Easy to read, nice amount of information, easy to clean. Not quite enough information for my field of precision machinist and mechanical engineer. Easy to understand charts for a novice and the diagrams help a lot especially with the gears and pulleys. would like to see a section on lubricants but that's just a personal thing, there are no downsides to this, it is more then I will ever need. Machine shop instructor: great teaching tool. So much more relevant and easy to use information than the "other" reference book. Laminated grease-proof pages a definite plus. Much more durable. Relevant to the point charts that are easy to read. Love the drill point gage. For every project this book has helped a lot. Love the book - central to my shop. Suggest adding commas to large numbers, e.g., 1,000,000 vs. 1000000. Also the section on Tolerances pg., 71 could use some clarification. I think it is a good book, I don't do a lot a machining and engineering but on projects that i am placed on it helps. Charts and such are great to have on hand. I am still a novice but have learned a good bit from this book. This is really helpful to have all of the info contained in the book in one source. From spanning sizes, cutting fluids, lubes, pitch diameters and so on it makes getting the job right very easy. All of the info in a single source book. Nice size to store in tool cart, tool bag or in cargo pants pocket. Nice price also. Great book for a pocket reference. Has a number of helpful charts and formulas in a much smaller book than a machinist handbook. Compact, concise reference material that I can use in the shop. Packed full of much of the info found in the engineers handbook in a more compact and usable form. Size, type of binding, and the coated pages! Nice touch! The most handy shop reference in my shop. The index isn't too subdivided and it gets me to my information fast. Coated page covering and lay flat design. Expensive. The most expensive book I have every brought. I have got pretty much all the workshop reference books available but the one I ALWAYS reach for first is the Black Book. Well laid out, good use of colour, font size (just) large enough, great quality paper and coated. Ring-bound so lies flat. Rounded corners so doesn't get tatty. (Just) small enough for your shop coat pocket. Would maybe like a larger version with larger font-size (maybe A5) - so not a pocket version. Some sort of edge markings or thumb cutouts for quick indexing. An electronic version would be useful sometimes - for searching! Great book, with tons of information. Even stuff that you wouldn't think to be in there. I like this book very much. The laminated, matt finish pages are really nice. Text could be little bigger, but i guess thats a limitation of pocket size books. Not too sure about the wire binding tough. Im thinking it has been selected to make the book easier to flip through and to stay open and flat on the table, and it works very well for those purposes. But it also makes it easier to damage the pages and binding, especially when carrying it in pockets as intented. Overall tough, a very positive experience! Great to have all specifications in one book, especially knowing that it is accurate! Bit expensive for what it is. Just wanted to say thank you. Found this very informative as I'm new to engineering. Great tool to have in the toolbox. I like the laminated pages that don't get dirty even when your hands are dirty. Full of useful content that is easy to find. Always have a copy near me in the shop. Such a useful reference for the shop. I might have to get another. Good reference book. Covers a lot of good reference material for practical manufacturing applications. Great for fabrication / machining processes. I am a Custom Bit and Spur Maker. I do a lot of Lathe work in making custom Horse Bits. This black Book has made my product a 100% better. When in doubt I can answer questions and do a better job. Thank you for this Book. Great Handy Tool to have in the workshop! All the info you will ever need. As others mentioned, perhaps quick access tabs or something similar might make it easier to find sections you need quickly. Also, a hex (Allen) key chart for appropriate socket head screws/bolts might be useful (similar to spanner selection chart). Very handy reference book, I use it more often than I thought I would. Always keep it in the glovebox of my work van. Very nice that the book has been carefully designed to be you in the dirty workshop and out in the field, that the pages are glare, grease, and tear proof. Big thumbs up. Excellent resource! As a first year apprentice mechanical fitter I have found the content invaluable. Unfortunately, if you don't know what you're looking for, the book is extremely hard to navigate! The index is all over the place, same content in an alphabetically categorized order would be ideal! Wish I would have stumbled upon it sooner. I learned that no one needs to know everything. But you have to know where to find information and this book give you everything you need to know and more! Being an exterem DIY enthusiast I cannot even start to explain how useful this book is. Should have acquired it earlier. Really nice book to have. A lot of usefull information. Very nice and easy to read. Cover pretty much everything. Comes with drill sharpening guide!!! Very useful to me as a apprentice. Great book, starting to get into machining and is a great tool! Alll the the normal information required for machining and more! Small, easy to clean and stays open. Very good clear information . Love the paper, spiral binding, and colors! Has even more information about machining than I expected. Longtime Machinery Handbook user but this book feels so much more durable and convenient. Not really a con...more of a suggestion. As a self taught engineer/designer/maker I would love a book that has a bit of the electrical, fasteners, threads, and machining all in one small book. A "Makers" book....doesn't have to be too in depth just cover the standard info required/encountered when prototyping projects (i.e. the places I have tabbed in my Machinery Handbook for years). This is my "go to" book! Excellent quality, easy to find the information you are looking for. Sturdy, easy to read, lots of information packed into a nicely sized book. I was disappointed that there was no woodruff key information, I had to go to my Machinery's Handbook. This book replaces a lot of loose formula sheets that float around the workshop and get lost. It's great I have pretty much put my A4 size reference folders to rest. All inclusive, good job ! Can't think of any as I have gone through the whole book and it's all great ! Easy to read. So much info. Comes as, also with a tool. A digest of all the regularly used bits of Machinery's Handbook in a much easier to handle format. Clear printing, spiral binding easy to leave open. Insanely helpful, book is small but loaded with useful information. Use this multiple times weekly and it was worth the money. Useful drill point gage inclided as well. Small and fits right in your pocket. This little book replaces so many spreadsheets and notes it is not even funny. All the charts, tables, calculation tables i have collected and created over the years - gone. Don't need them anymore. Can't believe it took me so long to find this. Every single page from 1 - 172 is a pro! Colored and compact. I love useing this book so much! Great book, can't stop looking through it! Getting the Fastners Black Book can't wait!! I am very grateful because several technical information ( wich is hard to find when you are not an engineer) relevant for my work are together in one portable and organizaed book. Lots of information on Burrs, grinding wheels & tungsten carbide grades.Love the ilustrations detail. Fantastic book, few people i know have them and use them alot in the shop, i will be getting the other books in the series! I get this book out everytime i make a part. The Formulas and drill charts are really handy! Brilliant little book, so much information. Perfect size, very good quality. I purchased this book for the specs on carbide inserts and for all the charts. Am amazed at all the other information I now have at my fingertips. Well worth the small price. Compact, easy to use, full of useful information, wipe clean pages, wide variety of engineering/shop info. 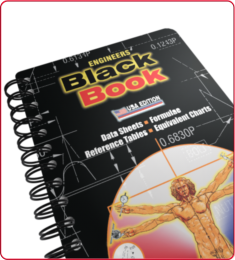 The Engineers Black Book is so much quicker and easier to use than the Machinists Handbook. Info that used to take several minutes thumbing through the handbook, now takes several seconds using the EBB. Love the lay flat design and the coated pages. Having just got my copy, I know it will be of great assistance in my shop. Don't bother going into the machine shop without it. If you have a spanner in one hand, then you better have this in the other. It is a pocket sized engineering encyclopaedia! My day ALWAYS starts the same...safety glasses, ear plugs, BLACK BOOK...or my day doesn't start! non that I have found yet. This is an excellent reference for IPS standards and sizes, and the drill point guide is quite useful. Next to the Machinist's Handbook (aka the Bible), this is probably what you really need to get if you'd like a quick reference that covers almost everything you're likely to come across on a standard day in the design/production/job shop. It's now a mandatory text for my town's machining college. Lots of good reference material that doesn't take much bench or desk space. Plastic coated pages feel like they won't pull out easily. It appears to be durable, contains concise information. Brilliant book, very handy to have as there is so much information in it. I can't overstate how important this book has become to me. I refer to it frequently whenever I'm in the workshop, and easy access to so much information helps me work faster and more accurately. Huge amounts of useful data, organised in easy to find structure. Resistance to workshop conditions, meaning I'm never afraid to keep it close at hand. Great Book. It contains a lot information on the types of tools and basic suggestions for uses and what you can do with it. Great information for threads, which can be a pain in the put to look for. Carbide inserts or well organized. Durable, compact booklet. I will be carring it everywhere I go. I believe for acme threads the depth of the threads is 1/2*TPI +.01. So far that is the only thing I have a question on. But it could be defined differently than I am accustomed to. Very useful and quality guide that's well worth the price! NOT a Con, but the only improvement I would consider making is to color code the outside edges of the pages so you can flip through quickly to find specific main/major multi-page sections distinguished by colored "tabs". None that i could see for the kind of jobs i under take. Very convenient little book. Good size, Handy bound pages! A cracking book for sitting on my desk at work! Doesn't take up much space and is packed with good information. Would have liked to have seen some general information on bearings and weld symbols. Great addition for the workshop and design office. Handy for Sequence of Operations work, tool selection and general reference at both production and design time. May benefit from more extensive index. Great very useful & easy to use. Oh I wish I had had this book 30 years ago! I was very excited as I had this book in my hands. It is actually overwhelm my expectations. This book is not only good for looking up values it also has an entertaining aspect. I have currently no use for it in the workshop as I still am setting the workshop up but just reading it was very interesting. Learned a lot of new stuff. The design and choice of materials is perfect. I really love this book and will probably also purchase some of the others. Binding - no annoying dirty tricks to keep the book open when working and looking up at the same time. Paper - laminated. I really had to take several looks at it before realizing that it is laminated. Feel like plain paper. Repells grease and dirty and maybe even better: it is tear proof. Content - very much different stuff and very detailed. I LOVE it! Detailed content. e.g. Part numbers, DIN ISO and other norms listed. Formulae - stuff I haven't seen or used for ages but also tables. Drill point sharpening gauge - probably the most useful you could put along with this book. Really compact. In size and content. Absolutely convenient and useful. - The pouch where the gauge is stored was already defective upon receipt but I could until now not make up a better solution. - Rather small letter size. I have to take of my glasses to read it. May be my personal problem, have to check my eyes :) The letter size was chosen in favour to the book size to keep it tiny so I am fine with it. - At least for Europe. The list of distributors is totally out dated. Actually is only a company in the UK distributing the book and they do it in the rip-off style. Taking more than 3 times (!!!) higher price plus shipment. So it would cost more than 80$. So I decided to wait 1,5 month and ordered it in the states. I don't like the binding. 99% relevant information for day to day tasks is there in your pocket. Highly recommended. Packed with great pictures and detailed yet brief instructions. Very useful book. Originally purchased for the carbide insert into but much more useful info. Very handy easy to read lots of useful information. Loads on handy information. Great quality printed and touch. I should have purchased two, One to keep clean in the house and one for the workshop. Excellent reference in a small, useable format. More useful information at your fingertips than constantly going online. Minor. For an old feller the writing gets a tad small on some. But nothing wearing my readers can't fix. Very well laid out, easy to read, great topics. Great contrast to Machinery's Handbook which is hard to use and difficult to find info. I think this will get a lot of use. I've had it a day and already used it. I can find info in it quicker than the internet most of the time. Good selection of information, relevant to most users. Great layout and I love the use of colors to highlight information and make it easier to read, especially for those of us that are getting older. There will always be information that is not in it, due to it's scope. Love the book, very well made - packed with great information. A perfect addition for our workshop. Very useful book. Used daily in mechanical design work. Good size, lay-flat design, lots of info. Lacking circlip standards but that may be a bit too much of a specialty topic. Just one vital piece of information missing surface cutting speeds for various materials using different tools ie mills lathe hss carbide inserts etc you have the conversion table great but which cutting speed to choose for a particular diameter? The easiest to use, accurate engineering reference available at a sensible price. Cleanable, ideal for use on the bench. Not a single problem with this, does exactly what it's designed too! No book is better for everyday quick references on the job. This is the go too. Fits easily in the back pocket of my jeans. This is literally the best book I've got for the workshop. Got it for Christmas and I've used it numerous times already. The information is invaluable and the production of the book is great! Fantasic book. A must have for gearhead folks! This is a must have for every gearhead out there. is full of information, nothing is missing and portable anywhere, thanks to pocket size. Pages are waterproof or "oilproof". Wire-o binding system has its advantages and disadvantages, transportation may bend and break, the reading is exceptional, given that the book will fold in on itself. Full of info, charts, tips and image. Waterproof and "oilproof" pages. Pocket size. Inch and metric system. ---> There is no translated version in Italian <--- Wire-o binding system can be improved. Every thing I need to know. A must for every hobbyist or anyone with an interest in machining or has a workshop. Bit small for those of us with deteriorating eyesight, but bigger size would increase the cost tho. Amazing resource. Just got this for christmas and I'm using information in it already. No idea how I worked in the shed without it. This is an excellent reference book for working in a shop. I am a hobby machinists and find myself going to this book more and more as I learn new things about the trade. The most often used information distilled down for the Machinery's Handbook, in one small, easy to use, lay flat package. Affordable considering whats inside this little gem, easy to find the information, made with nice quality materials. Lays flat so the pages don't flip on you while using the info you just found. GREAT BOOK. Love it. For starters and beginners. Has many answers to my questions. Can read/look-up for hours in spare time. Very nice pocket size. One small for on the road/pocket size, and another much larger for readable details/tables (without reading glasses) as a 'cooking-book' . You already made the nice large tables for on the wall, but sometimes you need other pages. Great information and easy to follow. Highly recommended quick reference book and handy size to keep in your tool box. Loaded with all the information the average machinist needs daily but cannot remember, all in a neat little pocket book. The perfect addition to any machinist's work station or engineer's desk. It has a wide spread of information that will be incredibly valuable and save some time not having to look it up in old textbooks, etc. The section about identifying carbide cutters alone is worth the whole book for me! It'll have a section for everyone. Easy to read, easy to find the information you need. Great size for keeping close to you as you go from the shop to the desk. great little book has all kinds of useful information at your fingertips on stain resistant pages. Great addition to the machinist's toolbox or the engineer's desk. Plastic coated easy to clean pages, nicely set out and easy to read. I haven't got mine yet. Book is well made, and has all information that you need for your shop. Excellent quality, easy to read and find important information. Uses metric and imperial. Easier than internet. I could not find any cons yet. easy to use and understand- lots of information. well worth the cost. Perfect for keeping on your desk to use as a reference for almost anything engineering related - couldn't be without it now. Wipe clean pages great for industrial environment usage. As a hobbyist , I am constantly looking for resources that help me to understand the terminology and best practices when operating these machines. The Engineer's Black Book not only contains an excellent collection of charts and tables but also provides explanations of how to apply this information appropriately such as how to set up a sine bar or properly sharpen a drill bit. I learn something new every time I open it. This book has a wealth of useful information. I can't believe it's taken me so long to find it. The materials used are hard wearing and should last a lifetime. This book contains a wealth of information in a clear, concise format that is easy to navigate. Yes, the information can be found in many places but the benefit of having such a wealth of knowledge collated in one pocketable reference guide cannot be underestimated. There is always room for improvement however from what I have seen, this is by far the best thought out pocket book of it's kind. Covers would benefit from being more rigid, perhaps made from plastic sheet with an elastic closure/ page keeper, torque recommendations for the featured bolt specs would be useful, price is a little strong for the current construction but would be more reasonable if the rigidity and strength were improved so it might survive better in the workshop or pocket. Great little book! I use it almost every day. Don't think about buying one, just do it! Plenty of useful information. Durable. Simple, well designed graphics. Free drill sharpening gauge! I think a stainless steel gauge would be a nice improvement. I had seen this for sale in MSC here in England,after watching ABOM79 on YouTube showing off his copy,I didn't hesitate to order. Full of so much useful data that I am constantly using in my tool room. Plenty of useful content all in one place, excellent for hobby and pro machinists/engineers alike. Useful and easy to find data backed up by clear and often colour pictures. The pages are coated and easy to keep clean. Pocket size. None that I've found yet. Maybe add some welding data?? Packed with info and easily fits in your pocket. Everything you need to know at your fingertips . Aluminium drill gauge prone to damage. best book I have in my home workshop would not be without it now. A Must have! Very useful in every situation at the workshop even when sharpening tools.you're unsure of something? For sure you will find the answer in the black book. Found it very useful for when in doubt i have found all the answers. Despite full of data and it's size the information is read with ease. Good printing that I can even read without my glasses. The coated pages sure help. It Would be better if the Thread charts were included within this book too, would be nice to have some helicoil info too & possibly info on Milling cutters too, Pricey for size? I have been meaning to get a copy of this book for so long and i finally brought one and it is so damn handy. Any time i get stuck with something i should know but have forgotten i can refer to the book! Great book has taught me alot and is a great ref book. Love the grease proof finish on the book aswell. Grease proof book and has sped up production by elimating calculations. I didnt find this book earlier!!! this book is very helpful and handy, I bring it with me thru out the shop. A handy, pocket sized, reference book. Full of all sorts of stuff I did not know ! What a fantastic reference book! I can find almost everything I need quickly and it makes a great bit of reading. Its hard to put down. Thank you for a great addition to my library! Clear, concise and pretty much all-encompassing. Easy to keep clean and very durable. Awesome grouping of information. Spiral bound for easy use at the workbench. Brilliant accompaniment to Machinery's handbook. Brings all the updated specs and modern tooling. The section on Carbide tips etc is invaluable and the drill point gauge is the easiest i have used. Excellent. I wish i had known about this fabulous book years ago ! There 's stuff in this book that I didn't know about. How about that learning something new. It would be nice to have the common welding rods sizes and amperages or the common mig settings for different metal thicknesses. Really pleased with it everything inside I want to know and more. Good quality, usefull refrence book containing excellent info for machinist/ mechanics. I do miss some flags for quic refrencing the different "chapters"
Perfect choice of paper and binding for a shop reference book. Super range of information, the best that I've come across in this handy format. "Plastic" paper, lay flat format, colour, much easier to read in bed than Machinery's Handbook! Perhaps a small section on files, reamers and measuring instruments would be useful. Such an easy to use reference book compared to machinerys handbook . Well laid out ,concise , compact size , grease proof pages and when you lay it on the bench it stays on the page you were looking at . They come with some handy gauges depending on which one you buy . Would like to see model engineers thread data in the book , other than that i can't fault it. If my suppliers here in Sydney had one or these tied to the sales counter so i could see what is inside i would have bought all three books years ago and i would say so would many others . i bought them because a youtube video from Bruce Whitham he went through them and showed the contents , you can't judge a book by its cover and can't look inside if it is plastic wrapped! A fantastic wealth of information across all spheres of engineering. Accurate and easy to read information in a compact and easy to carry ring bound book with high quality pages which should last a lifetime. I wish I had bought one years ago! All the info & tables you need in quick easy to find reference. Real time-saver. Easy to use, binding stays open at required page, pages wipe clean, really well designed. All the info & tables most hobbyists & professionals will ever need without wading through thousands of pages of Engineers Handbook. It's all there in an accurate, well organised, well referenced clear manner saving huge amounts of time. Ease of reference, handy size, binding stays open at whatever page you want, pages wipe clean of oil,dirt,liquid etc. Vast amount of topics covered. An excellent, concise workshop companion. Highly Recommended. Well made with protected pages. Insert info is very welcome. Would like to see a section on multi-groove drive belts, square form threads and basic welding info. A protective over-sleeve will help protect it long term. Everything I need right there in my pocket! Small, concise and current and I love the carbide insert info! No where to attach a chain so other techs don't walk away with it. People keep borrowing it and not returning it. Great shop pocket reference, loaded with information ready at your fingertips. Spiral Binding lays flat! No glare paper makes it easy to read near tool lighting. This will be a great asset to my apprenticeship. A variety of helpful information in one place is going to save me a lot of time on researching and will provide means to teach myself some basics so that when I'm being trained/mentored, I'll be able to better understand. Great tool, helped me greatly through university on programs such as auto cad and solidworks, and i can see myself purchasing more of these books to have in different places such as the workshop and work. Nice size and easy clean. Great for someone who Didn't follow his Calling! & did another trade.. THis thing is so useful that it replaced my beloved Machinist Handbook! This has already proven to be a useful resource for not only basic electrical work, but fundamentals of construction for electrical systems. Well built, I'm not worried about keeping it clean or it tearing. Great book. Very informative. Would buy other titles. Use book a lot. Excellenct publication, just about everything you will ever need to look up is in it. I love this book! You really have thought of everything. Even has a workshop proof coating! outstanding book everything you need to know in the trade I've been a fitter and turner for over 35 years and it is the best quick reference book i have seen for old school and modern machining. none really a screw pitch gauge of common threads as well as the drill point sharpening gauge in the back would be a nice bonus. Great book, nothing that's not in it! So much in such a small book that's fits in your pocket! This compiles everything everything I have and will learn at school! Can anything be wrong with perfection? This little pocket sized book is one of my most valued tools. All the information i need in my pocket: doesnt need batteries. Small, easy carry in a pocket, all the data in a logical and easy to find order. Details are spot on. Amazing book. Takes everything that we would need and puts it in one place! This is a serious must have for all engineers! Great little book. A great, small, concise book just loaded with data. No waffle, just info - just how I like books to be. A must have for any engineer. Very handy book to put in your site bag to check on when you forget. Too many to list. Easy to understand. Could include some measuring information. Easy to read and understand. A must have for any shop. Covers several different items and has great detail on each one. Small enough to fit in a pocket or tool box. Well worth the money. As an apprentice engineer, this has all the general manufacturing information and data I might require on a day to day basis. Easy to navigate. Compact and good quality. Very helpful for my engineering apprenticeship. Great little resource.Well laid out and easy to find what you need. Best little hand reference going around, Take it with me every where I go. My go to reference. More practical and useful than the Machinery's Handbook. Pocket size, easy to find information, concise, grease proof, and the drill guide is sweet. This is a mighty fine book full of splice and little tips and tricks. Great job! This is a great source! I am a student and find it very useful t okeep in my bookbag for reference! Great book. I use it every day. A great asset. As important as any other tool in my workshop. This is the book to have at your side for quick references and information. All your daily needs will be in this book. Has more information than you could ever want. Very helpful. I am not an engineer, I work in the Screw Machine industry. I recently bought your book and I use it regularly. I love the no smudge pages. Brilliant! Wonderful resource for a new entry worker into the field. Hand for looking up thread sizes, bolts and torque values. The coated pages are an excellent touch. No more grease smudged pages. For the USA edition, tap info on metric sizes should also have number, letter, or fractional apprx. equivalents (e.g. 6x1.00 = #9, 7x1.00 = 15/64, 8x1.00 = J, etc). Hi Ray, Thank you for the suggestion. We will include these details in the next edition of the Engineers Black Book. Wish I would have bought it sooner ! Great handbook. Small and handy, carry with me when im working. A wealth of information in one handy book. Easy to find the information you are looking for. some Spanish words may be to advance for some people. The next book to having the Machinist Bible. Information in Small easy to carry size. Easier than the Machinery Hand Book. Covers every aspect I have needed so far. Accurate. Great information and very useful. Nice size, well layed out, and durable. Wish I had bought one sooner. Great layout. Nice size. Pages well protected. Excellent reference. Everything is well organized and clear. Saves a lot of time when looking for information instead of searching Machinery Handbook. Easy to read reference. Layout is very good. Protected pages are a plus. Very handy! I will be buying the other black books soon. glare and grease proof pages are a plus. Perfect size, amazing amount of information in a small package. Small size, huge amount of daily use information. My husband let Santa know he would like this book. He absolutely was thrilled with it and will use regularly. Great size, packed with lots of charts and information! I'm getting back in to fabrication and welding and needed some quick reference book. This fit my needs very well. Compact, Sturdy, Lots of great information at your fingertips. This is a great reference tool for anyone entering or currently occupied in the engineering industry. I use it in my college classes to reference information. 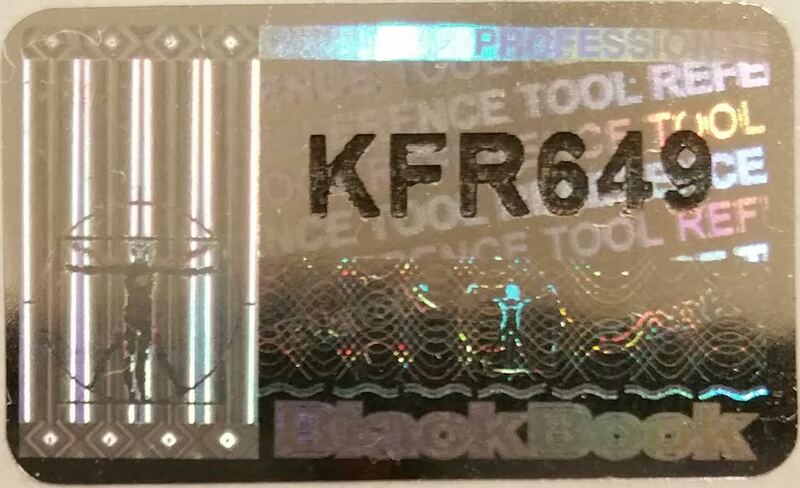 Engineers Black Book, great tool! It´s a great little book with a lot of information! If I only would have know about it before! I recommend it 100%. -Compact size with A LOT of very useful information. -Made out of great material that protects itself from stains. -I would like it in digital format. Quick reference when you're out in the shop. I recently used it for some thread profile data. As a technical writer, it is a great and handy companion to have on my desk for quick referrals. Can easily maneuver through the pages to find what I need! Excellant quick source of reference. Once I started using it. It stays on my desk. Much easier to use than the old stand by Machinery's Handbook. Not that there's anything wrong with the Machinery's Handbook. Lots of useful information in one little book. Easy to use and reference. Use it on a daily basis. Compact, laminated, spiral bound, has all the "good stuff" plus more! Could include more info on certain sections but almost everything is covered good. Depends on how technical you want to get. Quick & easy to read. Durable pages. No matter how many resources you have, it doesn't get easier than this! An excellent quick reference for all kinds of engineering and machining tasks. Lots of good information. Greasy fingerprints wipe off easily. Nice detailed carbide insert designation chart. Well made... Seems like it will last awhile. Need expanded speeds and feeds for milling and turning comparable to machinery's handbook. I mostly bought the book for the drill sharpening gauge that comes with it as it's the best one I've found, but the book is truly fantastic. Since I received the book I often find myself sitting down with it just to flip through the pages. The book is quite fascinating and a great pocket reference. Laminated pages allow for easy cleaning and protection from grease, water etc. Spiral lets book lay flat. Laminated for protection from the environment. Lots of good easy to read charts and illustrations. Pocket size. Drill point gauge pocket, to keep them together. I find myself wanting to have more information in the book, but cannot think of anything to add.